1 JOHN 5:4 KJV "For whatsoever is born of God overcometh the world: and this is the victory that overcometh the world, [even] our faith." 1Whosoever believeth that Jesus is the Christ is born of God: and every one that loveth him that begat loveth him also that is begotten of him. 2By this we know that we love the children of God, when we love God, and keep his commandments. 3For this is the love of God, that we keep his commandments: and his commandments are not grievous. 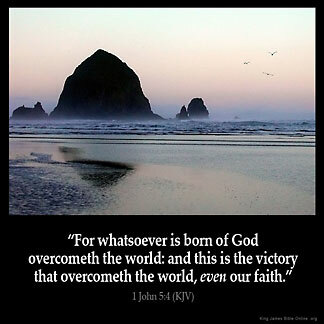 4For whatsoever is born of God overcometh the world: and this is the victory that overcometh the world, even our faith. 5Who is he that overcometh the world, but he that believeth that Jesus is the Son of God? 6This is he that came by water and blood, even Jesus Christ; not by water only, but by water and blood. And it is the Spirit that beareth witness, because the Spirit is truth. 7For there are three that bear record in heaven, the Father, the Word, and the Holy Ghost: and these three are one. For whatsoeuer is borne of God, ouercommeth the world, and this is the victorie that ouercommeth the world, euen our faith. For whatsoever is begotten of God overcometh the world: and this is the victory that hath overcome the world, `even' our faith. Anything which comes from God is able to overcome the world: and the power by which we have overcome the world is our faith. For whatever is born of God, overcometh the world: and this is the victory that overcometh the world, even our faith. For al thing that is borun of God, ouercometh the world; and this is the victorie that ouercometh the world, oure feith. 5:4 For whatsoever - This expression implies the most unlimited universality. Is born of God overcometh the world - Conquers whatever it can lay in the way, either to allure or fright the children of God from keeping his commandments. And this is the victory - The grand means of overcoming. Even our faith - Seeing all things are possible to him that believeth. 1Jo 5:4 For whatsoever is born of God. All who are born again, and have the new life, overcometh the world, in the sense that they do not love it and obey its dictates. The victory that overcometh the world, [even] our faith. The source of victorious power. As faith gains in strength the world loses its power. for he says in all things we are more than conquerors and we should fear not even as little children new born's in christ for we have overcome the world.the moment we receive Jesus Christ into our lives, we overcome the world and when our faith is added we become more than conquerors even before the enemy plans. I am a born again child of the living God : He is my heavenly Father : Though Faith I stand : I must act on that Faith that God has given to me otherwise I will not overcome the world : Be of Good courage : God will strengthen your heart : I have the victory , even when I don't look or feel like it as long as I walk by Faith : Faith pleases God : When His children are walking in Faith : HE RESPONDS !!!! Victory !!! The analyses mentioned are very good but none speak about the wording of the passage, in particular the use of the word 'whatsoever' which denotes anything ranging from human beings to animals. Could someone shed a little light on the usage of the word please? Hiebert says, The new birth gives the believer the potential of victory, but the realization of actual victory depends on our active exercise of faith. 1 Every born again believer has the provision to be an overcomer, but he must choose to appropriate the provision in order to be victorious. Overcomer is not a status automatically conferred upon all children of God. John is certainly not suggesting that all believers are overcomers and, therefore, worthy of receiving the rewards promised in Revelation. On the contrary, he is saying that all believers have equal opportunity to be victorious because of the new birth. God Has Given Us All Power To Overcome The Worldly Desires Every Circumstance That Comes Our Way By Faith.